This is the surf report I've seen far too often this summer, and unfortunately, when I'm not surfing, I'm not writing. Maybe that doesn't make much sense, because you'd think if I'm not surfing, I'm doing something inside like writing. Not the case, particularity when I aim to write about surfing! The point of all this -- surfing is inspiration. It's more than just a sport, more than a lifestyle. When you're out in the water, trying to survive against behemoths or build your skills on easy riders, it sparks something in you that, for me and many others, flames into creative output. You may notice (or maybe not), that I've written more in the past two weeks than the past two months. Well, we had a tropical storm drift off the coast of the Carolinas early last week and I was able to catch a moderate morning session with a good friend of mine. Later in the week, Hurricane Hermine passed through and we tried to hit the back swing of the storm. It ended up producing only tiny, clean shore breaks, but I still had a blast. And here I am, writing my third post in wake of it. The same is true for writing about spiritual things too. If I haven't connected with God much, the Inspiration section of this website becomes light. But when I'm reading the bible frequently and spending time with God, the words start flowing! So if you're feeling a little down and draggy as we head into fall, maybe just paddle out and catch what you can. Ignore the surf report and take a dip despite the conditions, and with no expectations. 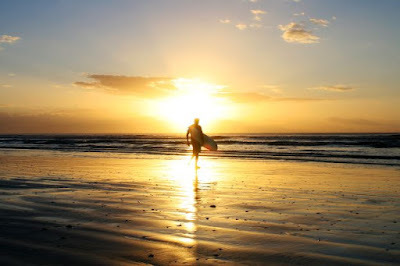 I think you'll find a spring in your step and energy to your day that only surfing can put there.